The chain saw is one of the most efficient and productive portable power tools used in the industry. It can also be one of the most dangerous. If you learn to operate it properly and maintain the saw in good working condition, you can avoid injury as well as be more productive. Check controls, chain tension, and all bolts and handles to ensure they are functioning properly and adjusted according to the manufacturer’s instructions. Fuel the saw at least 10 feet from sources of ignition. Must be approved by the Underwriters Laboratory, Factory Mutual (FM), the Department of Transportation (DOT), or other Nationally Recognized Testing Laboratory. 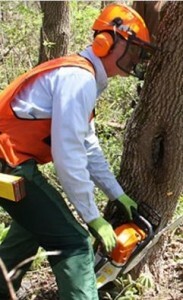 Keep hands on the handles, and maintain secure footing while operating the chainsaw. Clear the area of obstacles that might interfere with cutting the tree or using the retreat path. Do not cut directly overhead. Shut off or release throttle prior to retreating. Shut off or engage the chain brake whenever the saw is carried more than 50 feet, or across hazardous terrain. Be prepared for kickback; use saws that reduce kickback danger (chain brakes, low kickback chains, guide bars, etc.). Personal protective equipment (PPE), for the head, ears, eyes, face, hands, and legs are designed to prevent or lessen the severity of injuries to loggers and other workers using chain saws. Employers involved in tree removal/logging are required to assure that their employees are able to safely perform their assigned tasks. When loggers are trained to work safely they should be able to anticipate and avoid injury from the job related hazards they may encounter. Specific work procedures, practices and requirements of the work site, including the recognition, prevention, and control of general safety and health hazards. Requirements of the OSHA Logging standard, Bloodborne Pathogens standard, First Aid, and CPR training. How to safely perform assigned work tasks, including the specific hazards associated with each task and the measures and work practices which will be used to control those hazards. How to safely use, operate, and maintain tools, machines and vehicles which the employee will be required to utilize in completing the assigned requirements. This information is taken from one in a series of informational fact sheets highlighting OSHA programs, policies or standards. It does not impose any new compliance requirements. For a comprehensive list of compliance requirements of OSHA standards or regulations, refer to Title 29 of the Code of Federal Regulations. This information will be made available to sensory impaired individuals upon request. The voice phone is (202) 693-1999; teletypewriter (TTY) number: (877) 889-5627. Personal Protective Equipment – What’s What? Copyright © 2012 Chainsaw Safety Specialists. All Rights Reserved.